There is no availability for La Comarca Hostel on your selected dates. Such a great hostel!! While the kitchen and common area is not the biggest, the atmosphere and the staff are what makes this hostel. Everyone is very helpful and friendly!! The showers were also great and warm, just what you need after a long day of hiking. I am a solo traveler and I met so many lovely and amazing people at this hostel. Would recommend to anyone, especially considering the price. Really friendly staff, fun and relaxed atmosphere. Kitchen was a bit under stocked with basics though. Nice quite hostel but then still very sociable. Easy to jump of the bus and walk across the road with your big backpack. The rest of the town is then easy to walk around. 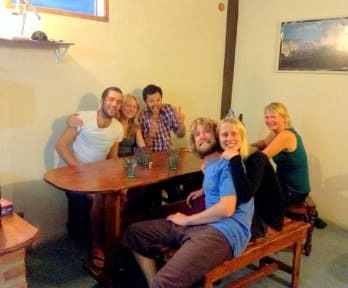 This hostel is really near to the bus station which is great, El Chalten in general is quite small so it’s close to everything that you need. The staff are absolutely lovely!! Go above and beyond always however the facilities here are muy muy básico! Great atmosphere, between guests and kitchens area but the cooking area can get sometimes packed as there’s limited space to cook and prepare food, but over all provided a clean shower and a comfy bed... so I’m happy with it! Location is great as it's right across from the bus station. A little tight for space however good atmosphere to chat with other travellers. Two common rooms with games and a television. Washrooms are new and clean. Bonus! Good value hostel. Staff are really friendly and helpful. The kitchen is too small though, so gets too crowded. Overall good atmosphere. Only spent there one night as I arrived with a late bus and its location was perfect, 30 meters away!